Sensoril ashwagandha is a patented brand of concentrated ashwagandha extract manufactured by Nutragenesis. Ashwagandha (Withania somnifera) is a medicinal shrub that grows roughly five feet in height and is indigenous to arid areas in Africa, the Middle East and India. It has been used in ayurvedic and various other medicinal systems of many hundreds of years. The name Ashwagandha translates to “vitality of the horse” and the herb is known for its strong horselike scent. Traditionally, ashwagandha has been used as adaptogenic herbaceous remedy (rasayana) that increases the user’s capacities to resist and deal with physical, mental and environmental stress. It is especially noted for its clinically substantiated capacities to balance hormonal secretions, and to modulate the activities of the thyroid. Sensoril Ashwagandha is found as the active ingredient in a number of different supplements including Life Extenson Optimized Ashwagandha, Doctor’s Best Ashwagandha, Natural Factors Stress-Relax Ashwagandha and Swanson Ultra Sensoril Anti-Stress Nutraceutical. What Is Sensoril Ashwagandha Used For? Ashwagandha affects the organism by modulating immune system actions, reducing inflammation throughout the body, acting as a slight sedative and naturally lowering blood pressure. Reducing anxiety, possibly by calming the hypothalamus and subsequently downregulating secretions of adrenaline and cortisol from the adrenals and pituitary respectively. This course seems particularly effective when ashwagandha is used in conjunction with intentional breathing exercises (pranayama). Sensoril ashwagandha may also be effective for osteoarthritis, tumors, Parkinson’s disease, tuberculosis, bronchitis, menstrual issues, backaches, immune system deficiencies, ulcers, liver disease, aging, fibromyalgia and more. Sensoril ashwagandha is said to be effective for balancing hormones and reducing damage incurred by stress. It acts as an adaptogen, which means that it helps to improve the body’s ability to maintain homeostasis. Supplementation with Sensoril ashwagandha may help to enhance health on various levels. Clinical research and experimentation continue to explore its potential benefits. As ashwagandha plants have been used for thousands of years as foods and medicines, continued usage seems likely safe for healthy individuals. When side effects do present, they are almost always mild and pass away quickly. Sensoril ashwagandha is safe for short term usage in women, men and children. Upset stomach, diarrhea and/or vomiting are possibilities for sensitive individuals. The long term effects of ashwagandha supplementation are not yet understood, but seem to be safe based on traditional usage. Ashwagandha contains significant amounts of iron and may not be suitable for those who retain iron because of hemochromatosis. 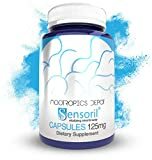 Pregnant and nursing women should consult with their doctors before using Sensoril supplements. There is some evidence that associated ashwagandha with miscarriages. Although the majority of Sensoril ashwagandha users report sedating effects, a small percentage experience mild stimulation. It is not established whether it is safe to apply ashwagandha directly to the surface of the skin. Sensoril Ashwagandha may interact negatively with medications targeting the symptoms of diabetes. If you are diabetic and wish to use ashwagandha, then please monitor your blood-glucose levels by testing several times daily with a glucometer. Ashwagandha is observed to reduce blood pressure. If you are taking antihypertensive medications, use ashwagandha only with the awareness and approval of your primary caregiver. Also, be careful if you have low blood pressure issues as pressure levels may become excessively low with supplementation. Do not use ashwagandha if you have ulcers of the stomach. Sensoril ashwagandha may irritate the gastrointestinal linings. If you have an autoimmune condition like MS, RA or HIV, then using ashwagandha may affect the functioning of the immune system. This could lead to a general worsening of already-present symptoms. Anyone with surgery scheduled within two weeks should discontinue ashwagandha supplementation. Those taking thyroid hormone prescription medications should use ashwagandha only with the permission of their endocrinologists. Sensoril ashwagandha is known to affect thyroid performance and may cause over-stimulation of the thyroid gland when used conjunctively with pharmaceuticals.